Today high tech digital solutions and connected health technologies make it possible to integrate data from various sources, including the gut microbiome, nutritional status, diet and lifestyle data. The accessibility of this information helps researchers to develop strategies for ‘precision nutrition’. said Puspita Roy, Senior Digital Programme Leader at the Precision Nutrition D-Lab of Danone Nutricia Research. Digital technology enables us to access and process data, which help to accelerate innovations and improve products. 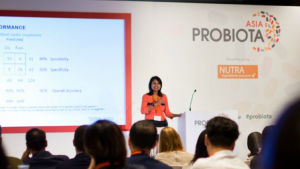 Speaking at Probiota Asia in Singapore, Puspita explained how digital technologies, from machine learning to image recognition, chatbots to big data analysis, will help to target and adapt the application of Danone’s integrated solutions and make precision nutrition a reality for moms and babies during their first 1,000 days journey. The LENA (Language ENvironment Analysis) system was in the spotlight. It comprises a small digital audio recording device which enables the continuous capture of baby’s sounds, and the machine-learning-based software which automatically processes the recorded audio data to generate metadata on distinct sound categories. In collaboration with LENA Foundation, Danone Nutricia Research utilised the system to automatically identify, quantify, and distinguish periods of crying versus fussing in a pilot sample of infants. The secret recipe is how to utilise the data, to establish better connection with parents, healthcare professionals, stakeholders to bring tailored nutrition to the next level. Read more here about the presentation given by Puspita Roy at Probiota Asia.